eCite - Encouraging the rational use of probiotics in combination with antibiotics - what are we trying to prevent? 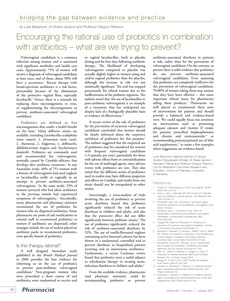 Encouraging the rational use of probiotics in combination with antibiotics - what are we trying to prevent? Vulvovaginal candidiasis is a common infection among women and is associated with significant morbidity and health care costs. Approximately 75% of women will receive a diagnosis of vulvovaginal candidiasis at least once, and of those, about 50% will have a recurrence.1 Recent therapy with broad-spectrum antibiotics is a risk factor, presumably because of the elimination of the protective vaginal flora, especially lactobacilli. Hence, there is a rationale for replacing these microorganisms to treat, or supplementing the microorganisms to prevent, antibiotic-associated vulvovaginal candidiasis. Probiotics are defined as live microorganisms that confer a health benefit on the host. Many different strains are available, including Lactobacillus acidophilus (now reuteri), L. fermentum (now casei), L. rhamnosus, L. bulgaricus, L. delbrueckii, Bifidobacterium longum and Saccharomyces boulardii. Probiotics are commonly used and recommended for vulvovaginitis, normally caused by Candida albicans, that develops after antibiotic treatment.3 In one Australian study, 40% of 751 women with a history of vulvovaginitis had used yoghurt or lactobacillus orally or vaginally in an attempt to prevent antibiotic-associated vulvovaginitis. In the same study, 23% of women surveyed who had taken antibiotics in the previous month had experienced symptoms of vulvovaginitis. Anecdotally, many pharmacists and pharmacy assistants recommend the use of probiotics for women who are dispensed antibiotics. Some pharmacies use point of sale notifications to remind staff to recommend probiotics to women if antibiotics are dispensed; other strategies include the use of stickers placed on antibiotic packs to recommend probiotics, even specific brands of probiotics.